This summer I read several books on self-sufficiency, and one of them mentioned growing sprouts. I decided to give this a shot, and ordered a sprouting jar set up. It has three different lids to allow you to flush out the water regardless of the size of your seeds, and it also allows you to have multiple jars going at a time. I put together a collage to show you the progress over 5 days. For this jar I just used regular lentils from my pantry. You can get all sorts of seed assortments specific to sprouting, and I have since ordered a few to try. So I started with 1/4 cup of lentils and soaked them overnight. After that, you start flushing them with water twice a day. It's really very simple. The boys enjoy helping and watching the sprouts grow. It is a very economic way to get fresh and healthy greens in your diet, with very little effort (and no weeding!) year-round. Fresh greens for just a quarter in January? Yes, please! Readers, do you like sprouts? How do you like to eat them? And fun for the boys to see too. Sprouts aren't on my radar. What do we do with them? I can't wait to see the comments. That's so interesting! I think I should try to make sprouts, from another bean. Here, we can find soy bean sprouts that sold in the markets. 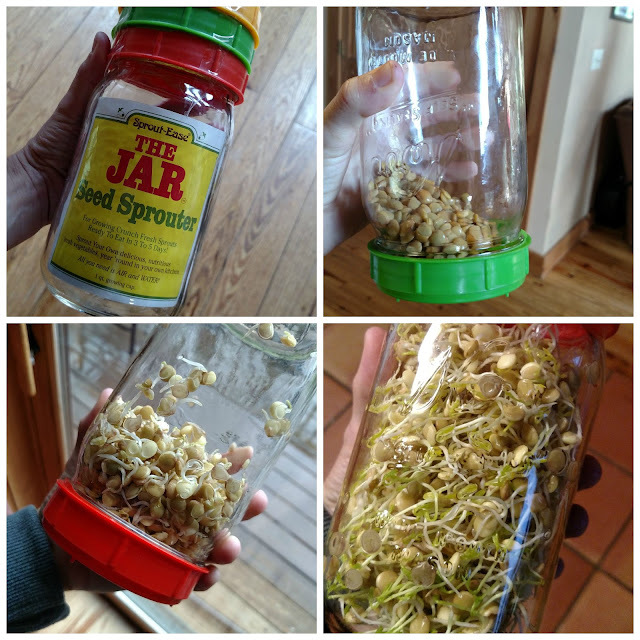 I used to grow our sprouts in Mason jars too-nothing tastes as good as when we do it ourselves. We were sort of forced to be more independent that I'd of liked as we lived on an isolated island with only two ferries a day and one little bitty grocery store with owners that had no imagination nor desire to please their customers...so they stocked almost nothing. Happy Sprouting. I haven't, but I need to. I have the seeds, and a glass grower. I need to get on that. That's impressive that they grow so well! My mom grows them and loves to toss them on her salads when we go to dinner at her house! Look at that! So easy! YOU ARE TEACHING US MANY THINGS THROUGH YOUR BLOG POSTS. THANKS FOR SHARING YOUR WORLD WITH US, LISA!! GOD MAY BLESS YOU ALL. Never liked them much but eat them once in a while. I've never tried them. This would be fun for the kids to do/watch though, so we might try it! I would love to do this! Sprouts are one of my favorite things to eat in salad. My Hubs made me some jars like that and I grow my wheatgrass in them sometimes.